I've tried in-ear headphones and I just can't stand them. That's why I walk around like an 80s DJ nowadays, with big over-the-ear muffs and Rick James t-shirt. 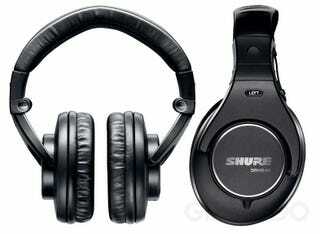 That's why Shure wasn't on my list of potential headphones until today. Shure has always been famous for their in-ear headphones, which to me feel like they are tickling my brain. Their new SRH line has three models. The ones above these lines are the top of the line $250 SRH840. According to Shure, they have 40mm neodymium dynamic drivers and are optimized "for studio recording and critical listening" with 102dB/mW sensitivity and 5 Hz - 25 kHz frequency range.